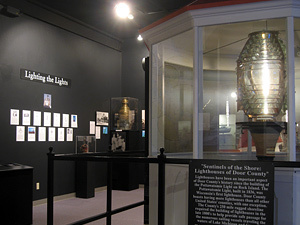 Enter the gallery and investigate a full-size replica of the Door County Sherwood Point Lighthouse lantern that’s typically 61 feet in the air. The lighthouse boasts an amazing 4th order Fresnel lens. See it close-up and examine its multiple layers of glass prisms, designed to concentrate the light and cut through a pitch-black night or thick fog. Adults and kids can use the interactive Door County lighthouse map to illuminate individual lighthouses and track their beams. Then, try directing light. Watch a short video and use individual prisms to focus a beam.